New Singapore Airlines (SIA) low-cost long-haul carrier Scoot announced today Gold Coast as its second destination after Sydney and confirmed its intention to launch services in Jun-2012. Scoot has decided to launch with two routes to Australia because the process of securing authorisations for China, which Scoot has said will also be served within its first year, is longer and more unpredictable. Gold Coast was selected over two other Australian airports on Scoot’s short list, Adelaide and Brisbane, because of Gold Coast’s excellent track record of success with LCCs, including Asia’s two existing low-cost long-haul carriers – AirAsia X and Jetstar. Gold Coast is also the largest airport in Australia currently lacking a link with Singapore. Gold Coast is the fifth largest international airport in Australia behind Sydney, Melbourne, Brisbane and Perth (see Background information). Among Australia’s top airports it has by far the highest LCC penetration rate. Currently LCCs account for 98% of total capacity (seats) at Gold Coast, including 90% of international capacity and nearly 100% of domestic capacity. Gold Coast is eager to attract more long-haul carriers and the airport is always an attractive choice for LCCs. AirAsia X and Jetstar are now Gold Coast’s only two long-haul carriers. AirAsia X currently offers five weekly flights to Kuala Lumpur while Jetstar operates five weekly flights to Osaka and a daily flight to Tokyo Narita. Flights to New Zealand now account for 40% of Gold Coast’s total international capacity and are operated with narrowbody aircraft from three carriers – Jetstar, Virgin Australia and Air New Zealand. 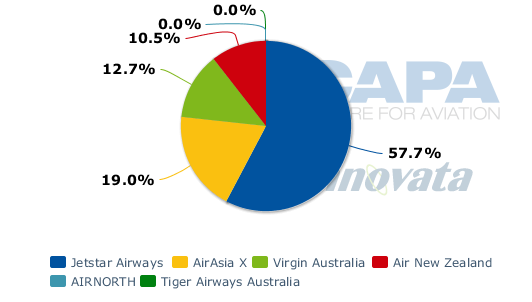 Jetstar now has a leading 51% share of total capacity at Gold Coast Airport (includes domestic and international) while Virgin Australia (which is still considered an LCC although it has shifted to a hybrid model) has a 41% share. Scoot will initially serve Gold Coast with five weekly flights, which should give it about a 15% share of international capacity (seats) at the airport. Scoot says it will launch the route in Jun-2012 but has not yet set an exact launch date. Scoot announced in Dec-2011 Sydney as its first destination, which is also expected to be launched in June but has also not yet been allocated a specific launch date. Scoot will have two 777-200s in its fleet by the time it begins operations in June. While it will have sufficient aircraft to launch both routes simultaneously, Scoot is planning to launch Sydney a few days ahead of Gold Coast as the carrier would prefer to perfect its operation with one route, using its second 777-200 as a spare, before moving to a two-route schedule. June is an ideal time for Scoot to launch services because in Singapore there is a month-long school holiday in June. Scoot will not be able to begin ticket sales until it secures its air operating certificate (AOC), which it expects will be awarded by the end of March. The carrier will be conducting proving flights over the next several weeks using a 777-200 dry leased from SIA. After the proving flights are completed and its AOC is in hand, Scoot will send its first 777-200 to SIA Engineering for retrofit. Scoot’s first aircraft is scheduled to enter the hangar at the beginning of April and be completed by early to mid May. The second aircraft, which will not take as long to retrofit as the first aircraft, is expected to be completed by early June, allowing Scoot to launch services in mid to late June with two aircraft. The retrofit process involves installing new economy class and recliner-style business class seats, both of which are being supplied from Germany’s Zim. Scoot is also hoping to equip its aircraft with a wireless in-flight entertainment system although it has not yet decided if it will be able to offer this from the beginning as it continues to negotiate with potential vendors over availability dates and pricing. While in the hangar for retrofit, all of Scoot’s aircraft, which are being purchased from SIA, will also undergo a heavy maintenance d-check. Scoot has booked four consecutive maintenance slots at SIA Engineering, meaning its third 777-200 should be completed by the end of June and its fourth aircraft by the end of July. This will allow Scoot to launch two more destinations in 3Q2012. At least one and potentially two of these destinations will be in China. Scoot is also looking at potentially launching in 3Q2012 one destination in Korea or Japan. Scoot decided against selecting China for either of its first two destinations partly because China prohibits foreign carriers from selling any tickets on China routes until it secures a Chinese landing permit. Scoot can’t lodge an application with Chinese aviation authorities for a landing permit until it receives its AOC. This is also the case with Australia, but in Australia airlines are allowed to start selling tickets before the AOC is secured and the landing permit application is even submitted. There is always a risk the landing permit will not be secured in time, but with Australia the process is much more predictable and should be quicker than China or other potential Scoot countries such as Japan. Given Scoot is a new airline subsidiary from a well established airline group, rather than a completely new airline, it is a safe bet the carrier will have all the approvals it needs to launch Sydney and Gold Coast services in June. China can be unpredictable and bureaucratic but once it receives its AOC, Scoot will immediately begin the process of securing the required approvals from Chinese authorities. Scoot should be in a position where it can announce its first Chinese destination in April or May. Scoot will still have to refrain from beginning ticket sales to China until the landing permit is in hand, which would likely not be until mid-2012, allowing for a launch of services to China sometime in 3Q2012 if everything goes smoothly. Additional destinations in Australia are highly unlikely this year unless Scoot runs into serious regulatory hurdles in China and other North Asian countries. 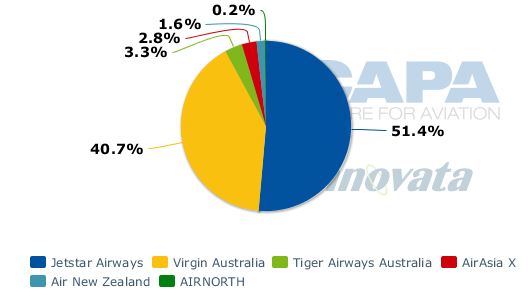 But the carrier could potentially add a third Australian destination in 2013 or 2014 as more 777-200s are added to its fleet. Brisbane, which was on Scoot’s Australia short-list along with Gold Coast and Adelaide, is now not unlikely to be served by the carrier at all because of its proximity to the Gold Coast. Brisbane is Australia’s third largest international airport and competes for leisure traffic with Gold Coast. The two airports, located only about 70km apart, are both gateways to the popular tourist destinations of southern Queensland but Brisbane also attracts a modest amount of business traffic. Full-service carriers currently only account for 55% of capacity at Brisbane as Qantas is the airport’s largest carrier with a 40% capacity share. Virgin Australia is the second largest carrier at Brisbane with a 31% capacity share while Jetstar only has an 11% share. Several foreign full-service carriers also serve Brisbane instead of Gold Coast including SIA, Emirates, Etihad, Cathay Pacific, Malaysia Airlines, Thai Airways, Korean Air, China Airlines and EVA Air. Brisbane-Singapore is already served by four carriers, making Gold Coast a more attractive option for Scoot as the airline looked to differentiate itself and stimulate demand. SIA already operates 19 weekly flights in the Brisbane-Singapore market while Qantas and Emirates each operate one daily flight and Etihad operates three flights per week. The presence of Emirates and Etihad likely had a big impact in keeping Scoot away as both carriers tend to compete aggressively on price on their fifth-freedom routes. Scoot is not generally afraid to operate alongside SIA, which it will do in Sydney. But Sydney is a bigger overall market with a much higher concentration of business traffic, making it more capable of supporting both SIA and Scoot with limited impact on SIA’s existing business. At Sydney, Scoot was attracted by a huge local market with relatively high fares due to a lack of competition (only the BA/Qantas joint venture and SIA and serve Singapore-Sydney) – characteristics which are not in place in the lower fare, more competitive Brisbane-Singapore market. Scoot has said it wants to operate a mix of routes that are currently served and not served by SIA. With Australia it makes sense for Scoot to follow this strategy and serve one SIA market and one non-SIA market. Gold Coast is the biggest international airport in Australia not currently served by SIA. The icing on the cake was the success the two carriers Scoot is emulating, AirAsia X and Jetstar, have had in the Gold Coast market. Singapore was also high on Gold Coast Airport’s wish list (Singapore is the biggest destination from Australia not served from Gold Coast) and the airport made an attractive joint offer to Scoot in conjunction with local tourism authorities. In announcing the new Gold Coast-Singapore route, Scoot said it has signed a “partnership agreement” with Tourism Queensland, Gold Coast Tourism and Gold Coast Airport. Gold Coast Tourism CEO Martin Winters said in the statement that with the new flights from Singapore “the tourism city achieved a new standing” and it will now be “easier for travellers from all over the world to experience all that the Gold Coast has to offer”. Scoot also had Adelaide, the capital of South Australia, on its short list. Adelaide is an intriguing market and could potentially become Scoot’s third Australian destination. But in the recent evaluation it fell short primarily because unlike Sydney it may prove to be too small of a market to support both SIA and Scoot. SIA now operates one daily flight on the Singapore-Adelaide route while Qantas also serves the route with three weekly frequencies. There is no low-cost long-haul carrier currently serving Adelaide although the airport has long-haul services from three Asian carriers – SIA, Cathay Pacific and Malaysia Airlines. Adelaide is potentially well suited for low-cost long-haul carriers as it is primarily a leisure market. But for the SIA Group there is a significant risk of cannibalisation. Scoot has said it will not replace SIA in any market or take over any of SIA’s existing flights. With Adelaide it would be hard to imagine Scoot entering and not replacing at least some of SIA’s frequencies given the relatively small size of the South Australian market. Adelaide is now the fourth largest market between Australia and Singapore. Melbourne is second largest after Sydney but did not get serious consideration from Scoot as this route is much more competitive than Sydney. Melbourne-Singapore is now served by four carriers – SIA, Qantas, Emirates and Jetstar – with about 29,000 roundtrip seats per week. As it is already served by an LCC in Jetstar, Melbourne-Singapore typically has lower fares than Sydney-Singapore. Melbourne Airport tried to persuade Scoot the Melbourne/Victoria market is big enough for a second LCC and fifth overall carrier on the Singapore route but Scoot was unconvinced and did not include Melbourne in its short-list. Melbourne could still be revisited by Scoot as a potential future destination, depending on how Scoot’s first two Australia routes perform and if there are any capacity changes on the Melbourne-Singapore route by competitors. If Jetstar decides to launch Sydney-Singapore, Scoot may also be more compelled to launch Melbourne-Singapore. For now Scoot seems keen to avoid overlapping with Jetstar’s long-haul routes from Singapore, which also include Auckland and Beijing. But inevitably there will be some overlap and as two carriers expand they will start to fight over market share in the still emerging low-cost long-haul market. Perth-Singapore is the third largest market between Australia and Singapore, just slightly ahead of Brisbane-Singapore. But Perth-Singapore was not at all considered by Scoot as the route is within narrowbody range and is already served by both SIA and Tiger Airways, a short-haul LCC which is partly owned by SIA. Darwin-Singapore, the sixth largest market between Singapore and Australia, was also not considered as it too is within narrowbody range. Darwin-Singapore is now only served by Jetstar but will be launched by SIA regional subsidiary SilkAir at the end of March. There are currently 64,000 weekly seats in each direction in the Australia-Singapore market, according to Innovata data. Sydney-Singapore accounts for 33% of these seats, followed by Melbourne at 24%, Perth with 18%, Brisbane with 17%, Adelaide with 5% and Darwin with 2%. As soon as the new Scoot service is launched, Gold Coast will surpass Darwin and become the fifth largest Australia-Singapore market with about a 3% share of total capacity. Cairns also previously had non-stop service from Singapore but now is only served from Singapore with a one-stop narrowbody link via Darwin from Jetstar. Scoot did not seriously consider Cairns because it is generally viewed as too small of a market and too seasonal to support a year-round service from Singapore. Cairns-Singapore could be a big enough market to potentially support a smaller aircraft but unfortunately for Cairns the route is just outside narrowbody range from Singapore. As was the case with Sydney, Scoot is being relatively conservative in selecting Gold Coast as its second destination. Gold Coast is a proven destination for long-haul LCCs and Scoot will be looking to replicate the successes AirAsia X and Jetstar have had in the market. Australia overall represents an easy choice for Scoot’s initial routes given the complexity involved with launching services to China. Certainly China will come but Scoot is taking the safer and less risky path by focusing on Australia first.